You know that Halloween is all about candy. It’s about buying candy, and eating candy, and for some people, it’s about making candy too. But what if I told you that you could use candy to make candy cups that could be used to hold other Halloween candy? Did I just blow your mind, or what? 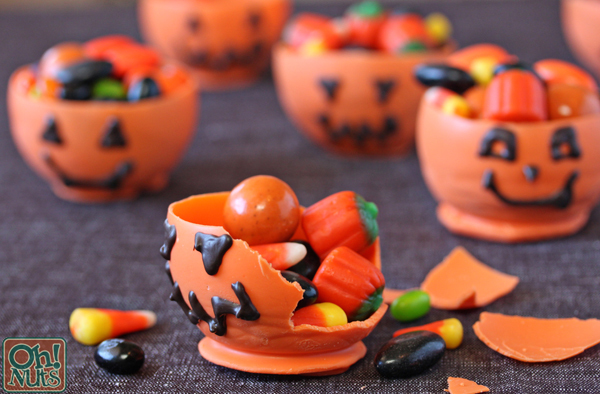 Can you believe these adorable pumpkin candy Chocolate cups are entirely edible? They’re made from orange melting chocolate wafers, which are a quick and easy substitute for melting, coloring, and tempering white chocolate. (Who has time for that when candy is waiting?) With these wafers, you melt them in the microwave and they’re ready to go. They are easy to use, harden quickly, and have a sweet vanilla taste. Best of all, they give these candy cups the perfect shade of pumpkin orange! You won’t believe how easy it is to make these pumpkin candy Chocolate cups. 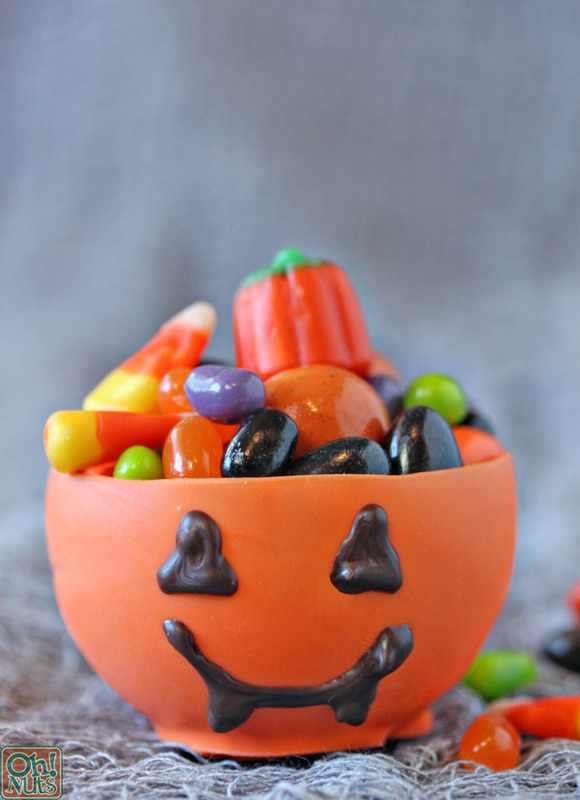 After you make them, fill them with your favorite Halloween candy–I used a mix of standards like candy corn, mellocreme pumpkins, and jelly beans, and also threw in my favorite gourmet candy–pumpkin spice malt balls. (Cannot get enough of those!) These would make such cute Halloween party favors, centerpieces, place settings, or edible crafts for older kids. While you wait for the melted wafers to cool, blow up the balloons until they’re the size you want your candy cups to be, and tie them off. This recipe yields 8-10 candy cups (depending on how large you make them) but you should blow up a few extra balloons just in case you make a mistake or a balloon accidentally explodes. I find that blowing up the balloons until they’re about 3 inches in diameter yields candy cups that hold about 1/2 cup of candy, which seems to be a good amount. 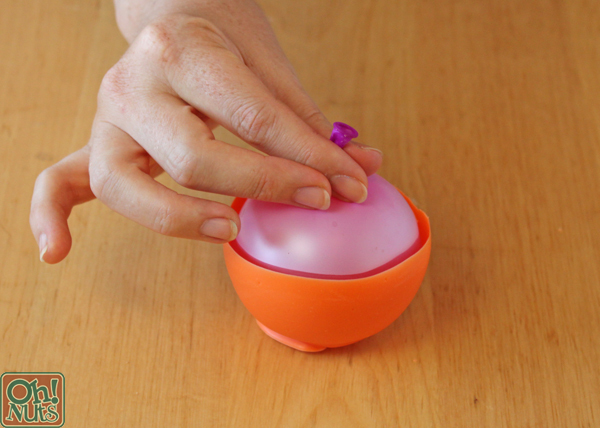 When the coating is still fluid but no longer very warm to the touch, hold a balloon by the knot and dip it in the melted coating until it comes halfway up the sides of the balloon. Rotate it around so that the sides are evenly coated. 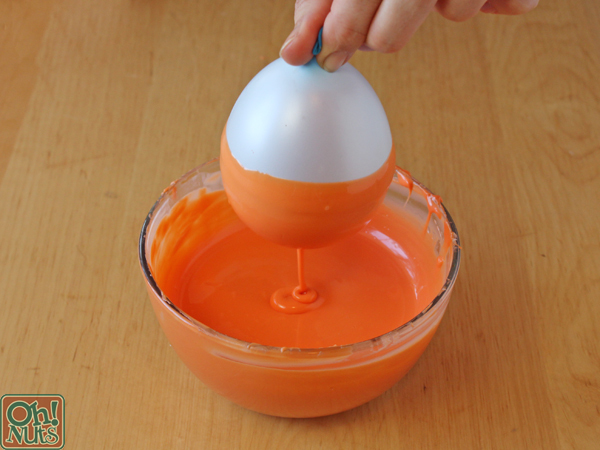 Remove the balloon from the coating and let the excess drip back into the bowl. Place the dipped balloon on a baking sheet covered in parchment or waxed paper. Repeat with the remaining coating and balloons. 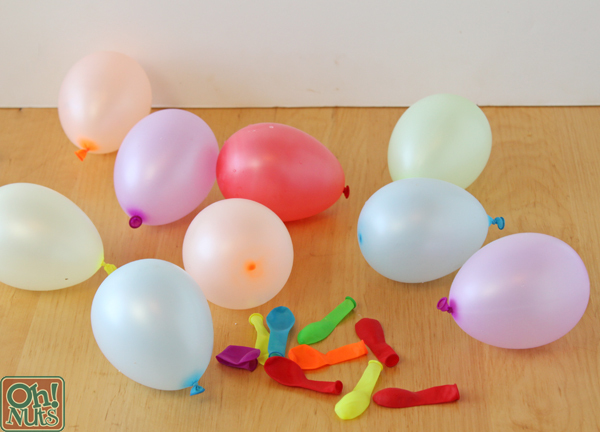 Once all the balloons are dipped, refrigerate the tray to set the coating, for about 20 minutes. 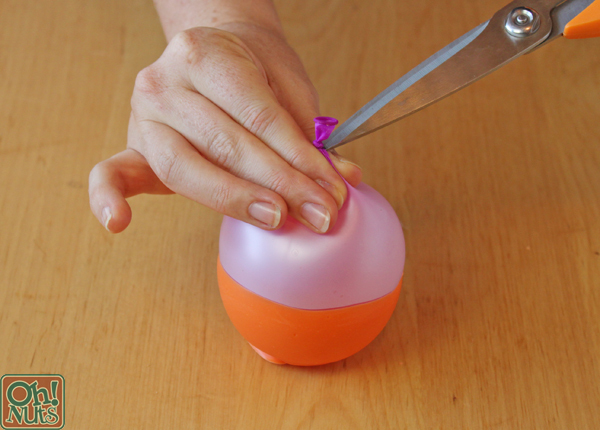 To remove the balloons from the candy shell, hold the balloon tightly right below the knot. Cut a small hole above your fingers, and carefully loosen your grip so that a small amount of air can escape. Gently let the air out of the balloon slowly and steadily. Use your other hand to help press the balloon inward and detach it from the side of the candy as it deflates. You’ll be most successful if you take this step very slowly. When most of the air has left the balloon, very gently peel it away from the bottom of the candy. Repeat until all of the balloons are removed from the candy cups. If you’d like, you can use a paring knife to level the tops of the cups and remove any uneven edges. You can also just run your finger along the top to smooth any ridges down. Do this step carefully and gently, since the cup edges are thin and delicate. 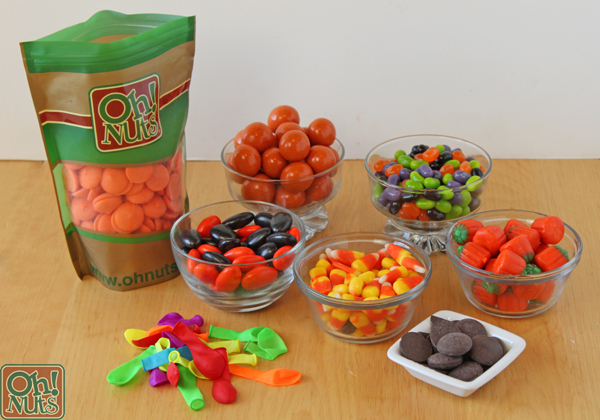 Fill the candy cups with a mix of your favorite Halloween candy, and enjoy! The melting wafers have a long shelf life, so you can get a jump on your Halloween planning and make these several weeks in advance. Store them in an airtight container at cool room temperature, and they should last for a month or more! As always, the full recipe and an easily pin-able image are below. Happy Halloween! Place the orange melting wafers in a microwave-safe bowl. Microwave them in 30-second increments, stirring after every 30 seconds, until melted and smooth. 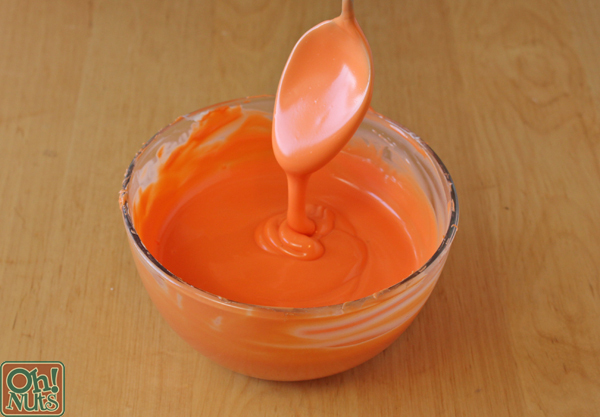 The texture should be on the thinner side–it should flow nicely from a spoon. If it seems thick or clumpy, stir in a spoonful or two of shortening, until it flows freely. Set aside to cool until it is barely warm. If you try to make these candy cups when the melted wafers are hot, the balloons will explode and it will be a huge mess! While you wait for the wafers to cool, blow up the balloons until they’re the size you want your candy cups to be, and tie them off. This recipe yields 8-10 candy cups (depending on how large you make them) but you should blow up a few extra balloons just in case. When the coating is still melted but no longer very warm to the touch, hold a balloon by the knot and dip it in the melted coating until it comes halfway up the sides of the balloon. Rotate it around so that the sides are evenly coated. 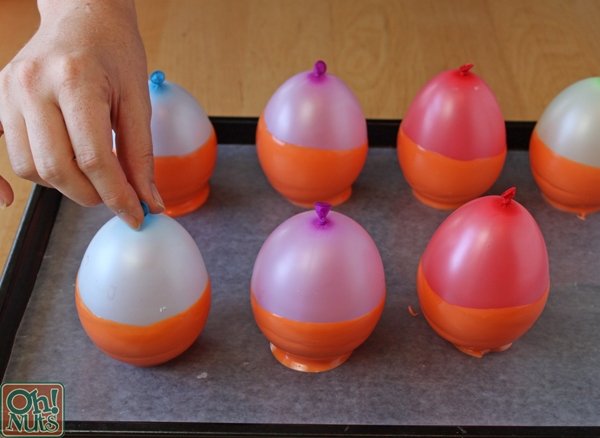 Remove the balloon from the coating and let the excess drip back into the bowl. Place the dipped balloon on a baking sheet covered in parchment or waxed paper. Repeat with the remaining coating and balloons. Once all the balloons are dipped, refrigerate the tray to set the coating, for about 20 minutes. 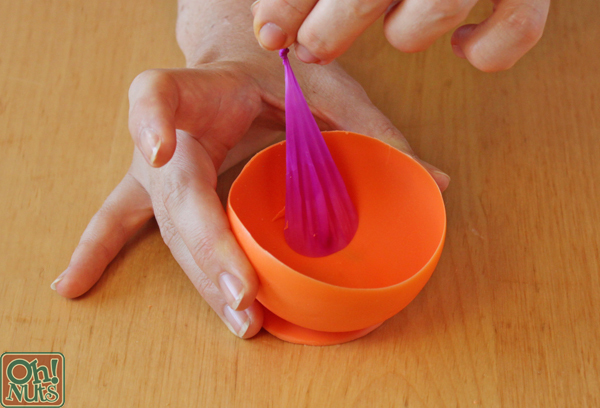 To remove the balloons from the candy shell, hold the balloon tightly right below the knot. Cut a small hole above your fingers, and carefully loosen your grip so that a small amount of air can escape. Gently let the air out of the balloon slowly and steadily. Use your other hand to help pull the balloon away from the side of the candy as it deflates. When most of the air has left the balloon, very gently peel it away from the bottom of the candy. Repeat until all of the balloons are removed. If you’d like, you can use a paring knife to level the tops of the cups and remove any uneven edges. 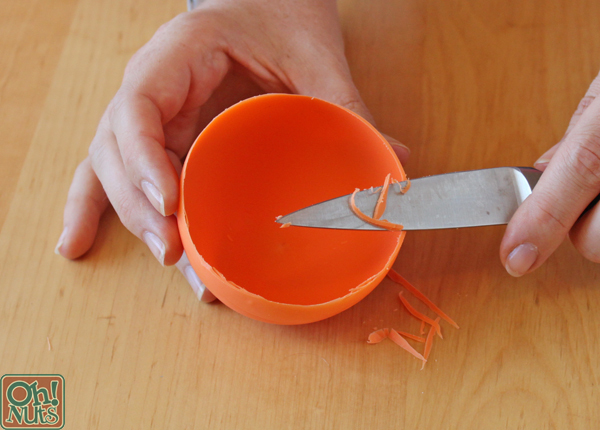 You can also just run your finger along the top to smooth any ridges down. 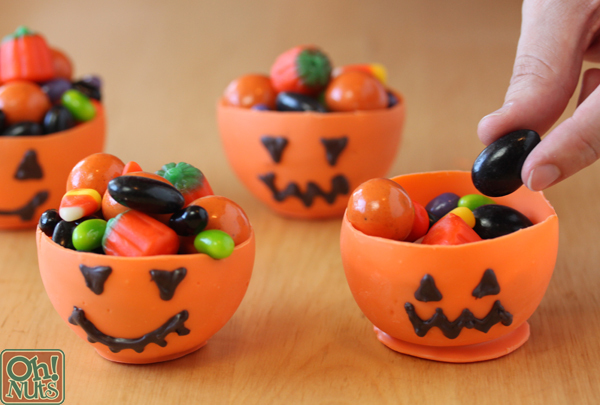 Fill the candy cups with a mix of your favorite Halloween candy. Enjoy! Cups can be stored at cool room temperature for several months–the candy coating has a long shelf life.